On Richard Clapton’s very first album, “Prussian Blue” (1973) – a dense and obscure work which yielded no hit singles – the young singer / songwriter marked out the perimeter of his creative landscape. It was the beginning of one of the truly enduring careers in Australian music. The album, and its creator, announced their arrival at a fascinating point in Australia’s cultural history. The country had just been swept up in a tide of reckless optimism with the arrival of the Whitlam Labor Government in 1972. After years of parochial inertia, the creative atmosphere was charged with static electricity and new dreams, inspiring a generation of visual artists and writers. But strangely, the domestic music scene was moribund. There was a never-ending supply of tepid, one-dimensional pop acts emulating foreign fashions, and plenty of blues bands like The Aztecs or Chain, but virtually nobody who was interested in using music as an vehicle for sonic expression or political change. It was into this void that Richard Clapton made his first tentative steps. Where every other recording artist wanted to sing about cars, drinking and girls, Richard Clapton entered his first recording sessions at the legendary Festival Studios in Sydney with a collection of songs that reflected his poetic temperament and his experiences in continental Europe. As subject matter, it was far from fashionable. The album disappeared virtually without trace, but Richard Clapton had arrived. The song was given the full multi-track studio treatment by Richard Batchens, who insisted on meticulously layering the guitars of Clapton and ace session player Red McElvie to create an elaborate wall of sound. The result stands up today as one of the most remarkable songs ever produced in Australia, a genuine pop masterpiece. Despite being rejected by Festival three times, and then only released as a B-side, “Girls on the Avenue” rocketed to #2 on the Australian charts, transforming Richard Clapton from obscure folk singer to fully-fledged pop idol in a matter of weeks. The album that followed, also called Girls on the Avenue (1975), showed that Richard Clapton was learning to harness his melancholia, creating songs of universal appeal. “Blue Bay Blues” – his gentle, heartfelt ode to Byron Bay (in those days little more than an obscure destination on the North Coast surf and hippie trail) – and the lyrical “Down the Road” remain as beautiful today as the day they were written. Although Richard continued to travel regularly to Europe to rekindle his creative fires, he was increasingly seeing his own work in the context of the Australian country rock scene that emerged through the 70s. Acts like Country Radio, The Dingoes, Ariel and Clapton himself were clearly inspired by the American singer / songwriters of the late 60s / early 70s – a broad church that included everyone from James Taylor and Jackson Browne to John Prine and Gram Parsons – but flavoured with something uniquely Australian. Up until 1976, the dark undercurrents in Richard Clapton’s songwriting had been dressed in a polite, 70s production gloss. As a lyricist he’d been more than capable of expressing unpalatable sentiments and difficult emotions, but in keeping with his country rock aesthetic, the music was dressed in the fashions of its time: layered vocals, muted drums and inoffensive, multi-tracked guitar work. But with Goodbye Tiger, everything changed. Richard Clapton’s relationship with both his record company and his producer had become fraught with tension, arguably to an irreparable degree. He was becoming frustrated by the very obvious limitations of the Australian rock scene and its conservative, incestuous ways. And in response to these external stimuli, Richard was beginning to drink heavily in the studio. The sessions for the album – again with Richard Batchens, and again at Festival – were tense and emotionally charged. But fortuitously, Richard had written an extraordinary batch of new songs – and in difficult circumstances, the band (which by this time included two mainstays of the Clapton sound, bassplayer Michael Hegerty and slide guitarist Kirk Lorange) played with a controlled, expressive rage. Goodbye Tiger was far more than just the best album Richard Clapton had made to date: it was the first great Australian rock & roll album, a landmark in the evolution of Australian music. As Richard describes it now, it was “a lot of negative emotions, channeled to create something very positive.” Opening track “Down in the Lucky Country” was an overtly catchy, upbeat track that purported to extol the virtues of a simple life in the lucky country. It was only when the listener paid closer attention to the lyrics that it became apparent that this wasn’t a happy song at all, but a sardonic, vitriolic dig at the political naivete and materialistic urges that underpinned Australian life in the 70s. Like Bruce Springsteen’s “Born in the USA” a few years later, it was an anti-anthem that was mistakenly adopted as an anthem – and in a sense, it was this misinterpretation that lent it some of its secret appeal. But it was a song called “Deep Water” which delivered the album’s finest moment. Ambitious in its musical conception and disarmingly powerful in its execution, it evoked emotions in Australian listeners like few songs before or since. The first half of the song is a beautiful remembrance of things past – a nostalgic recollection of a Sydney that has long since faded from view (“We used to go down to the beach at night / fireflies dancing in the promenade lights”). The anger and alienation permeates every crevice of the track – only to be washed away in an uplifting, baptismal coda. “The first half of the song is a recollection my childhood, remembering Sydney in the 50s and 60s in quite a nostalgic way … and then suddenly in the second half it leaps across to the dark side,” laughs Richard, recalling the track’s unusual structure now. One other selection from Goodbye Tiger which thankfully warranted inclusion on this Anthology is the album’s title track. Picking up on the same bittersweet themes explored in “Lucky Country” and “Deep Water”, “Goodbye Tiger” is a wistful, deceptively simple country-rock ballad of immense resonance. Not only is it a song that Neil Young might have written. It’s a song he would have been very proud of. After Goodbye Tiger, it was readily apparent that Richard Clapton’s days with Richard Batchens were beginning to come to an end. The success of the album had finally given the singer the means to pursue one of his long-held dreams: to record in Los Angeles with crack session players. The resulting album, Hearts on the Nightline, charted well in Australia but failed to attract the superlative praise that had greeted the previous album. The passion of Goodbye Tiger was absent. When Clapton returned to Sydney in 1980, he quickly realised that the time had come to move beyond his Southern Californian mindset. With the advent of punk and new wave – and young American artists like Bruce Springsteen and Warren Zevon – slick, superficial production values were suddenly out, and qualities like honesty, simplicity and integrity were back in. 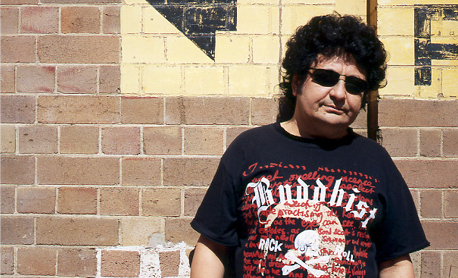 For the first time in his career – a career that now spanned five full studio albums – Richard Clapton decided to produce himself. The result was a moody, critically acclaimed album called Dark Spaces featuring tracks such as “High Society” and “Get Back the Shelter”. The years between 1980 and 1982 were pivotal ones for Richard Clapton – and for Australian music. The live scene was pumping with the sound of hundreds of new bands performing to huge audiences in massive, crowded rock pubs. It was a time of diversity, creativity and excitement and a new kind of national pride. Australian acts were being signed to recording deals like never before – and with the advent of FM rock radio, there was even a means by which local bands could take their music to a mass market. As a veteran recording artist and live performer, Richard had no particular reason to fit into this youthful explosion – but somehow, the music he made and the spirit in which he made it fitted perfectly. Having just signed to WEA records, he soon became a close friend to one of Australia’s hottest young rock bands, Adelaide’s Cold Chisel. He had also been asked to listen to a very fresh young outfit called INXS with a view to possibly producing the band. By the time he came to record his first WEA album, The Great Escape (1982), Richard Clapton had become such firm friends with Cold Chisel and INXS (who he did decide to produce) that he invited an amalgamation of both bands to perform on the album. The result, on songs like “I Am An Island,” was an all-star lineup that included INXS’s Jon Farriss on drums, Cold Chisel’s Ian Moss on lead guitar, Clive Harrison on bass, Harvey James (formerly of Sherbet) on guitar, Mick O’Connor on keyboards and Jimmy Barnes’ unmistakable tonsils handling backing vocals. The song seriously rocked, as one would expect. But if one track from this album is to be honoured, it must be “Best Years of Our Lives” – a song that was ostensibly inspired by a late-night phone call to Richard from his close friend and musical stalwart, Michael Hegerty, then based in Los Angeles. The caller was depressed and homesick and the conversation was long – but the resulting song is an extraordinarily powerful rumination on the passage of time and the inevitability of loss. It might well have started out being something quite specific and personal, but it ends up being a song of universal relevance, a song that uplifts the soul. Clapton’s ninth album, Glory Road (1987) holds a special place in the hearts of both the artist and his fans. Co-produced by the singer and INXS drummer Jon Farriss at the very same time that INXS were recording their international breakthrough album “Kick”, “Glory Road” was created in an atmosphere of intense creativity, frenetic activity and marathon partying – and from the first note to the last, the album is a masterpiece of concise writing and epic production values. It is, by most people’s estimation, Richard Clapton’s finest hour. On “Trust Somebody”, Clapton addressed a song to his friends in INXS – by then emerging superstars – and looked at the insecurities and doubts that come with fame and fortune. Set to a swinging, Motown-esque beat, and driven by a jet-fuelled chorus refrain, the song was an instant classic. On the title track, Clapton questioned the risks and sacrifices being faced in the pursuit of success. As INXS prepared to embark on a tour of Europe, terrorists were engaged in a campaign of random violence – including a bomb attack on one of the clubs the band was scheduled to play. The band were understandably concerned for their own safety – and it was this very real fear that inspired this emotionally-charged track. “I wrote this in sympathy for Jon and the rest of the band,” says Richard. “This song is obviously a plea for world peace, but written from a more personal perspective instead of just another protest song.” n 1989, Richard Clapton tackled an ambitious project: to record a live album, with an all-star band that had never performed together in public before, in just one night. With a lineup that featured Michael Hegerty, members of INXS and Cold Chisel and elements of Richard’s touring band, the aptly-titled “Best Years of Our Lives” served to re-interpret almost 20 years of recorded work. Despite the immense margin for error, the night was a resounding success – and the resulting album has the warmth of a great Unplugged session and the familiarity of a Greatest Hits package. Listening to one of the songs from the live set, “Ace of Hearts” (originally from “Hearts on the Nightline”), it’s easy to see why the album has become one of Richard Clapton’s most popular releases. The 1990s represented Richard Clapton’s third decade as a recording and performing artist – and the pace didn’t let up. In 1992, Richard produced a powerful new album – his first complete studio outing in six years – entitled Distant Thunder. On the title track, Richard blended references to the then-current Gulf War with images of disintegrating relationships. On the stunning “Oceans of the Heart” Richard addressed a subject that was acutely close to home: his own rather legendary love for hard-core partying. After a decade of almost perpetual partying and nightclubbing, the song was a frank admission that he had perhaps reached the limit of his physical resistance. After years of city living and constant touring, Richard Clapton took his wife and young family and dropped out of view for several years of rural living – producing another wonderful album, Angeltown, whilst in exile. Now living back in Sydney, Richard’s batteries are clearly revitalised as he prepares to take his songs into another decade – and a whole new millennium. Anthology closes with two new, previously unreleased tracks that conclusively demonstrate the undiminished excellence of Richard Clapton’s music. The first, “Little Pilgrims,” is a beautiful tribute to Clapton’s twin daughters Saskia and Montana. “My kids are my whole world,” says Richard with obvious sincerity”, and this song really came out of my love and compassion for them. It’s not hit single material, but it’s a very important track to me. I guess it’s about the inherent challenges of raising children in this modern world where 11-year-old kids bring guns to school and people sell heroin in video arcades. I guess I see it as expressing a similar sentiment to that song on What’s Going On by Marvin Gaye, “Save the Children”. The album’s closer, “Calling for You” sees Richard Clapton co-writing with two old musical collaborators, Guy Delandro and INXS guitarist Tim Farriss. Richard Clapton has never been rich. He has never had the pleasure of passing through life in a luxurious rock star bubble. In a career that now spans almost 30 years he has battled everything from bad managers and capricious record companies to drugs, debt, taxes, personal tragedy and a thousand room service dinners. The fact that he’s come through it all with his sanity – and his abilities – surprises all who know and love him. God bless him, and people like him.